Three cases of telecoms Conflict of Interest (CoI): case Berkeley, case FCC and case ICES – the CoI were possibly disclosed but does it mean that CoI were nullified and avoided? 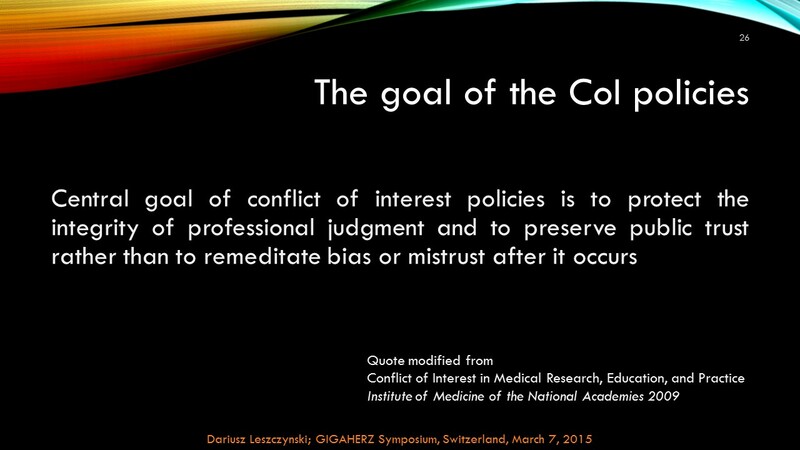 Americans are very conscious about the potential Conflict of Interest. They find it, they point it out and… not always it matters. Currently ongoing presidential election’s political campaign is a very good reminder of the American consciousness about CoI, when we read in news media about the possible business links between Donald Trump and Vladimir Putin or the problems of foreign donors for the Clinton Foundation, where Hillary Clinton is involved. Conflict of interest definition: A situation in which someone who has to make a decision in an official capacity stands to profit personally from the decision. For example, a judge who rules on a case involving a corporation in which he or she owns stock has a conflict of interest. In practice of law: judicial disqualification, also referred to as recusal, refers to the act of abstaining from participation in an official action such as a court case/legal proceeding due to a conflict of interest of the presiding court official or administrative officer. Now, the three examples of the CoI in relation to US telecoms: case Berkeley, case FCC, and case ICES. Possible/probable health effects of the radiation emitted by cell phones is a very controversial issue. Some, including telecoms, consider that as long as the safety standards are obeyed (set in USA by ICES) that long health of the user is not affected. Exposure to more radiation than permitted by safety limits is recognized as a health impairing factor and telecoms are aware of it. In brochures accompanying cell phones manufacturers inform that there is a certain distance between the cell phone and the body of the user that needs to be maintained for the health safety. It implies that telecoms know about the health risk problem and they provide appropriate warning. However, this warning is not provided in easily available form but the user needs to “search” for it… buried somewhere in the cell phone manual. Such, buried in manuals’ abyss, warning seems rather to provide “safety” for the telecoms and less for the users who nearly do not read manuals. The “safety” for the telecom if, in the future, cell phone radiation will be clearly demonstrated to cause health problems. Telecoms will be then able to say: we warned users and their health problems are their own fault caused by “improper” use of cell phone. And here comes the “double standard”: telecoms can provide warning of potential health risk, buried deep in the manual, but the same warning should not be displayed at the locations where cell phones are sold. 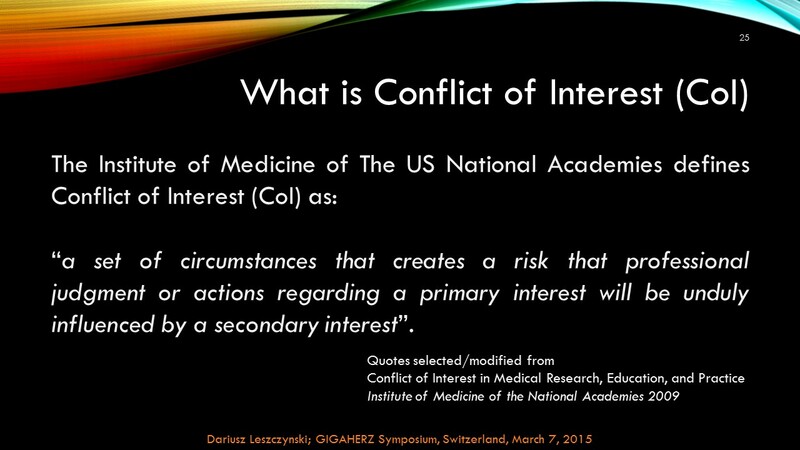 And here is the Conflict of Interest coming. One of the three judges that will render decision on Berkeley’s ordinance might have Conflict of Interest. Husband of the judge allegedly works for telecom industry and will be providing hardware technology for the deployment of new 5G wireless network. There is nothing secret about Mr. Wheeler’s work for CTIA as telecom lobbyist. It is well known and disclosed. However, how trustworthy are his decisions? In moments of ambiguity, is he taking side of the general public or the telecom? 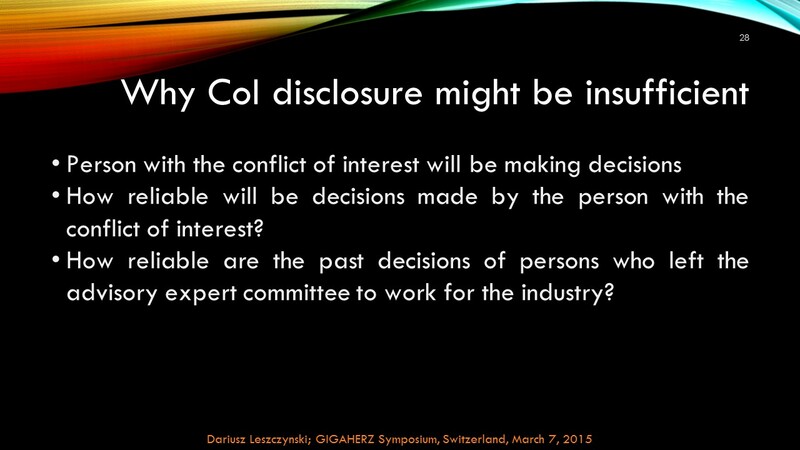 Having CoI does not automatically mean that decisions are influenced by it… but there might be… who knows for sure? ICES, equivalent of ICNIRP, prepares safety recommendations for the exposures of users by radiation emitted by cell phones. Unlike ICNIRP, anyone can apply for the membership of ICES and all embers of ICES participate in decision making process. Sounds nice… Not a “private club” as ICNIRP where participation is by invitation only and the invitees have to have the same opinion on radiation safety – this helps in reaching unanimous decisions… But ICES has another problem that caused me, member of ICES for a couple of years, to resign my membership in 2009. The problem is that the ICES membership is clearly dominated by scientists working or consulting for telecoms (see page 20 and onward in: scc39-annual-report-2014-2015). So, again, similarly to FCC/Wheeler, the ICES membership is disclosed up front but the Conflict of Interest remains because, again, in moments of ambiguity, are ICES members taking side of the general public or the telecom? 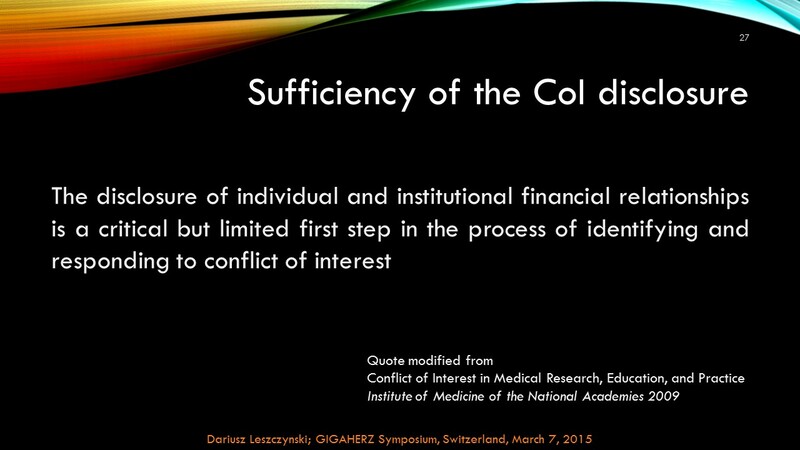 Having CoI does not automatically mean that decisions are influenced by it… but there might be… who knows for sure? 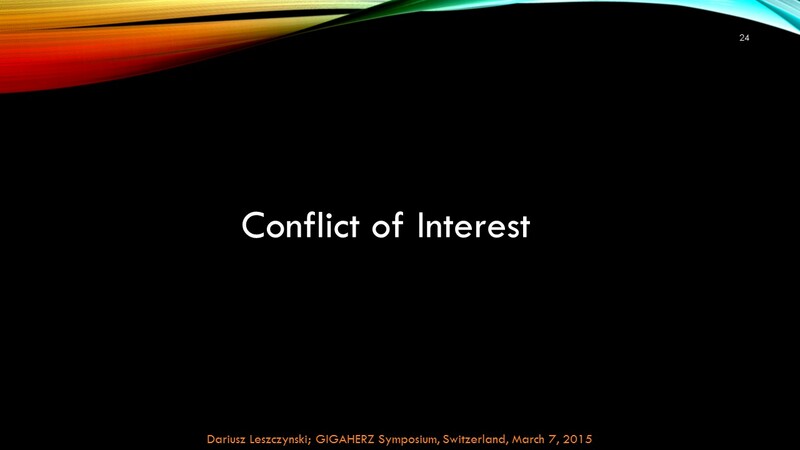 This entry was posted in Conflict of Interest, Mobile phones and health and tagged Belgium, Berkeley, BioEM2016, booklet, censorship, CK Chou, Clinton Foundation, CoI, conflict of interest, CTIA, Donald Trump, FCC, Ghent, health effects, Hillary Clinton, ICES, ICNIRP, IEEE, Institute of Medicine, judge, private club, Ralf Bodemann, recuse, safety standards, SCC39, Switherland, TC95, telecom, The Washington Times, Theodore Olson, Tom Wheeler, US National Academies, USA, Vladimit Putin, warning, yuge by dariuszleszczynski. Bookmark the permalink. Dariusz – Regarding your concern about ICES CoI, remaining a member and promoting a more balanced membership by encouraging non-industry scientists and professionals to join seems to be the correct course of action to take.